When should a theory be abandoned? "Lastly, looking not to any one time, but to all time, if my theory be true, numberless intermediate varieties, linking closely together all the species of the same group, must assuredly have existed; but the very process of natural selection constantly tends, as has been so often remarked, to exterminate the parent-forms and the intermediate links. Consequently evidence of their former existence could be found only amongst fossil remains which are preserved, as we shall attempt to show in a future chapter, in an extremely imperfect and intermittent record." -- Darwin, Origin, Chapter Six: Absence or Rarity of Transitional Varieties. If anyone were to ask, "how do we know that various dinosaurs ever existed", we would assuredly say, "because there are hundreds of thousands of complete and partial fossils collected from around the world". And there are known areas where there are many thousands of yet to be extracted dinosaur fossils. There is absolutely no question that dinosaurs existed because we have fossil evidence of their existence. So if someone asks how do we know if molecule-to-man evolution is true, the evolutionist should say, "because we have hundreds of thousands of "intermediate pre-human" fossils proving that man evolved from ape-like creatures", as their theory says we did. There's only one problem: There aren't any. The picture at left is in countless school text books and other evolutionist material. Yet not one of the creatures depicted in it are real - there are absolutely no fossils for any of them. These imaginary creatures exist only in the mind of the evolutionists. But the picture gives the appearance that these are real creatures for which which we have proof they actually existed. And that's what I always assumed, and probably you did too. So I was shocked to discover the truth - that there simply aren't any. Go to your local museum and you'll probably see real dinosaur fossils. But you won't see any real pre-human fossils. You might see a phony manequin meant to look something like one of the imaginary creatures at left. But its PHONEY. You can ask the museum staff if its real or not. If they don't lie, they'll tell you its not real. BECAUSE THERE ARE NO REAL PRE-HUMAN FOSSIL SKELETONS. Now, by Darwin's own measure his theory would be either confirmed or falsified by the fossil record. The only thing that would prove the molecule-to-man theory of evolution once and for all would be a series of full skeletons of pre-human beings, just like the evolutionists always show in their classic monkey-to-man drawings shown here. Darwin rightfully predicted that if it really happened there will be fossils in the ground to prove or disprove his theory. Note: We won't go in to all of the modern scientific advancements in biology which go completely against evolution. While these are certainly enough to destroy the theory, they are too technical for the average person to understand and there are very many websites out there which present this evidence. Therefore we shall focus on the fossil record. At the time of Darwin, archaeologists had barely begun to scratch the surface of the earth. Its now been more than 150 years since his book was published. We have found millions of fossils (the vast majority of which are fossilized in-situ by catastrophic, rapid water burial). But what about the critical test of Darwin's theory? Have we found thousands of these monkey-to-man skeletons? Have we found hundreds? Have we found dozens? Have we found even one? Interestingly, we have found NONE. ZERO. ZIP. After more than 150 years of digging, the only place these "transitional forms" exist is in the mind of "believers" and on paper. What does the fossil record actually show? That all life forms appear suddenly and fully developed with no sign of any intermediate, developing species to precede them (Don't be fooled by technical names like 'Australopithecines'. These are nothing but extinct ape bones and fragments which are NOT human ancestors. See also the Evolutionist Hoaxes page for details). By the theory inventor's own measure, evolution cannot be true. If it were we would certainly have found thousands of half monkey, half man fossil skeletons as his theory predicts. And keep in mind an important fact: Evolutionists believe that dinosaurs lived 65 million years ago, while they believe that humans evolved only a few million years ago. So if dinosaur fossils could be preserved for 65 million years - preserved so well that we have hundreds of thousands (or millions) of fossils spread around the globe - then surely we should have at least a few hundred fully preserved pre-human skeleten fossils shouldn't we? But where are they? There are none. Why? BECAUSE THEY NEVER EXISTED. Its as simple as that. So why would anyone still believe in the theory? Quite simply it has become a religious cult to those who choose to believe in it despite the lack of evidence. Plus there are billions of dollars at stake in keeping the false theory alive. Most of those who still believe in it just aren't aware of the facts, and have been indoctrinated since childhood. Others simply choose to remain willfuly ignorant rather than to accept that we are created beings. 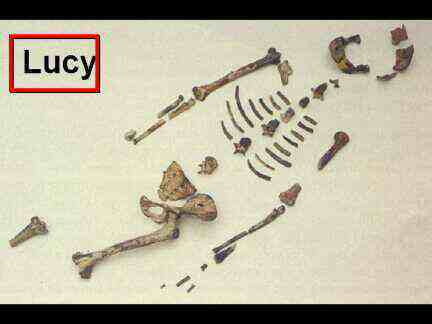 To this day, evolutionists will point to the "Lucy" discovery. Lucy is just another fraud in a long list of frauds starting with Piltdown man, then Nebrask man, Java man, Orce man. Dr. Johanson gave a lecture at the University of Missouri in Kansas City, Nov. 20, 1986, on Lucy and why he thinks she is our ancestor. It included the ideas already mentioned and that Lucy�s femur and pelvis were more robust than most chimps and therefore, �could have� walked upright. After the lecture he opened the meeting for questions. The audience of approximately 800 was quiet so some creationists asked questions. Roy Holt asked; �How far away from Lucy did you find the knee?� (The knee bones were actually discovered about a year earlier than the rest of Lucy). Dr. Johanson answered (reluctantly) about 200 feet lower (!) and two to three kilometers away (about 1.5 miles!)." Lucy is a fraud. Proven fraud from Dr. Johanson himself. If Lucy was a pre-human, then she was the first suicide bomber, because these bones were scatered everywhere! Notice there's no hands or feet? Pretty convenient, because these body parts would be essential for determining if a creature walks upright or not. Any evolutionist who still claims that Lucy is credible is either a liar or an ignorant fool. And yet, this fraud is still used in textbooks around the world. Not only is this extremely newsworthy but it casts a very unflattering light on so many scientists who, uncritically it seems, placed Lucy in the modern human line of descent, you won�t find it widely reported except in the Darwin-denier blogs and websites. This strategy is common when embarrassing mistakes are found in widely accepted evolutionary dogma. Keep it mum and let the embarrassing news become common knowledge over a long span of time. Meanwhile children are still taught a fraud in schools around the world. What a shameful mob the evolutionists are! *Note the "Favoured Races" in the title of Darwin's book. Darwinism has been used as the basis of racism by many, esp. by the Socialist Nazis of Germany and also Russia's Joseph Stalin - the greatest mass murderers in World history. It is also seen as a critically important teaching by Communists in their indoctrinations - Atheism is their official religion, and for very good reason. Christian's know that all people are created in the image of God - and are therefore equal, while evolutionists hold that some races could be more evolved than others. Just look closely at the graphic shown here to see how this is so. Reason 1: DNA is encoded information. Information cannot originate by random chance - it requires an intelligence and there are no known observable exceptions. Learn how INFORMATION is 100% proof that materialism cannot be true and really proves the existence of the Creator God! The challenge is now out to the evolutionists! Reason 2: Life never originates from non-life. This is the first rule of biology and there are no known observable exceptions. Evolutionists must insist that there is at least 1 exception - millions (or billions?) of years ago, back when there was a theorised "primordial soup", some sort of mysterious action (perhaps a lightning strike) produced the very first life cell and then everything on this earth evolved from this one cell. But very intelligent people have tried creating life from non life in the laboratory without success. If we can't even create life in controlled labarotory conditions, how then could life have come about randomly? But even if we could create life from basic chemicals in a lab, what would that tell you? That it requires intelligent intervention to create life! Were these important scientific laws left out of the evolutionary indoctrination you received in the government school you attended? I bet thy were. Of course they must not let you know about them because if they did you would never accept the theory they obviously so dearly want you to believe. But knowing these two scientific facts, coupled with the fact that there aren't any fossils to back up the theory, it all begins to crumble. God vs. Atheism - which is more rational? Ask anyone why Big Foot is a hoax and they should say because there is no archaeological evidence for them. That is, no bones or fossils have ever been found. Its that simple. But despite the complete lack of fossils some people still continue to believe in Big Foot. * But for the rest of us, why don't we apply the same standard with supposed pre-humans? Since there are no such fossils, evolutionists had to make up the story that Neanderthal and Cro-magnon skeletons are not fully human, but some sort of pre-humans. But don't be fooled by their deception - Neanderthals and Cro-magnons are 100% human, just like you and I, except that they lived much longer than us (because people still lived long lives directly after the Flood - see the Neanderthals and Cro-Magnons page). Evolutionists had to do this because there are no other fossils to hold up to the world as proof of evolution. If you are a critical thinker, you will apply the same standards to the evolutionist hoax as you do to the Big Foot hoax. Aside from the Cro-Magnons and Neanderthals, what can evolutionists hold up to the world as proof of evolution? Only a few fossils of an extinct ape from Africa named Lucy. 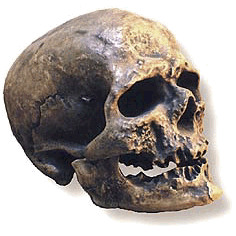 Picture of the Cro-Magnon 1 skull - fully human! Mutations and Natural Selection is the answer - Not! Evolutionary theory says that everything is a product of random chance. Everything from ants to humans were built by mutations, block by block over millions of years. But can this really be true? Over the last few decades we have learned some amazing things about not only the human body but about many other creatures. The key to gaining this knowledge has been our ability to see and study very small things - even at the molecular level. And what we have learned is that everything is complex and part of complex systems. Systems which cannot function without each part. If any part of a system is missing, the system cannot function. Think about a V-8 car engine. It has many integral parts which, if any were missing, the engine could not run. The crankshaft is a major part of the engine and if it were missing, it could not run. But what if a small part, such as the fuel line were missing? Same result - the engine could not run. 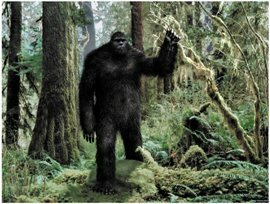 So we have this situation: A very small group of people believe in Big Foot despite there not being any physical evidence that it has ever existed. But they believe it because they want to believe it. All other people look upon this group with pity because of their obvious lack of judgement. Then we have a very large group of people who believe in human evolution - despite there not being any physical evidence for any of the many pre-humans which must have existed if human evolution were true. The same people who pity the Big Foot believers are doing the very same thing! But why? Well, isn't it really just a matter of "brain-washing"? Since childhood, we have all been taught about human evolution by all of our authority figures. When we combine this constant bombardment of evolutionary teaching with our inborn rebellion towards God, then you begin to understand why you are just like the Big Foot believers. Brain-washing is a proven technique. Knowing this may help you to realize that you quite simply have been brain-washed into believing something which isn't true. "I regard consensus science as an extremely pernicious development that ought to be stopped cold in its tracks. Historically, the claim of consensus has been the first refuge of scoundrels; it is a way to avoid debate by claiming that the matter is already settled. Whenever you hear the consensus of scientists agrees on something or other, reach for your wallet, because you're being had. Have you ever wondered how anyone could be gullible enough to be drawn into a religious cult? How could such a thing happen? Well, first it must sound reasonable on the surface. If all of the "deep secrets" of the cult were told up front you would just think, "that's stupid" and would walk away. For example, when Mormons come knocking at your door, they don't announce to you that you must come join their church because a man named Joseph Smith found some "magic goggles" which enabled him to read "golden plates" engraved in an unknown language, which reveal supposed truths which you must believe to be saved. You'd just say, "that's stupid" and slam the door (one would hope). Second, the cult's public disclosures of its belief must conform to the basic beliefs of the prospective cultist. For example, believing in the existence of God is pretty much a pre-requisite to joining a cult which believes in God. People are drawn into cults by a process of indoctrination, which amounts to brain-washing. And as this indoctrination progresses, the cultist is drawn further into the cult. At each step more of the cult's secrets are revealed. And, because the indoctrinators are very nice, and obviously wholeheartedly believe what they are teaching you, then you - because of your trusting, child-like nature - believe it too. According to the definitions above, Evolutionism qualifies as a religion. Here's something you've probably never considered before: Evolutionism is a religious cult just like any other! The cult is complete with its own deity, which is of course the "Evolution god" (which capable of anything), and high priests in positions of power - the evolution scientists. These priests have special "knowledge" and "understanding" that the rest of us don't have, and a secretive language which the rest of us don't understand. Have you ever read their "scientific" terminology? We must trust them because only they have the "education" and special intellect and knowledge to understand the "deep secrets" of the religion ("scientific" knowledge). It has whole armies of "teachers" in every school indoctrinating the children of the world to believe "the truth" of evolution. It has evangelists who write books and go about converting people to their religious beliefs about the origin of man. If you talk to evolutionists enough you will hear phrases like, "Diversity is no problem for Evolution". Do you see how they deify Evolution? Evidently Evolution is all-powerful, since nothing is too hard for it to accomplish. After all, the entire Universe and all life on this planet evolved from nothing! How is their all-powerful god different than the all-powerful God of the Bible? Do you see? But unlike other religious cults, this religion has a monopoly, much like the Catholic church did in Europe in centuries past. Its taxpayer funded and required educational subject matter by governments around the world. Not only does it fit the definition of a religion, it is a very dogmatic religion because they stubbornly hold that this Earth and the entire Universe created itself from nothing with no supreme being (God) involved, and that all elements "evolved" from hydrogen, and all life on Earth "evolved" from basic elements on this rock in a toxic atmosphere. They believe we have no "spirit", so when we die - that's it! There is nothing more after that. You spend 40 years of your life accumulating as much wealth and possessions as you possibly can, only to spend maybe 20 leisurely years in retirement, and after that - nothing! But do you really believe this? Are we only material beings in a material world with no purpose other than to work hard, accumulate wealth and perpetuate the species? Does anyone really believe this? Imagine you were to travel to the Amazon rainforest and found one of the as yet unreached tribes - people who have not yet had any contact with outside civilization. And suppose you could communicate with them and asked them how they thought the earth and the stars in the heavens came to be. And they told you they believed that billions of years ago all of the matter in the entire Universe was compressed into a tiny ball smaller than the size of a pin head which was spinning incredibly fast, and suddenly exploded and that's how we all got here. Wouldn't you think, "what primitive people they are to believe such a thing!" And yet, if an "educated" evolutionist tells you the very same thing you believe it without the slightest hesitation. Well, this is whatthe Big Bang theory says happened. But could you really believe this? Could anyone really conceive of all of the matter in the entire GIGANTIC Universe compressed into a tiny ball smaller than a pin head? And where did all of this matter come from in the first place? Did it come from nothing all by itself? How does matter transform from "nothing" into matter? Does this make any sense at all? Does it make more sense than an all-powerful Creator-God created the Universe? Like all cults, evolutionists start you out with slow indoctrination - in fact when you are just a child! Consider that when you die - and you will die - that evolutionist teacher isn't going to be standing next to you before God. This God gave you a brain to think for yourself. You are going to have to explain - all by yourself - why you ever believed such a silly cult-religion over His Word, which is backed up by clear archaeological and historical evidence. Like all cults, Evolution is a powerful delusion. Ask anyone who was formerly under cult power and they will attest to this. The reason it has power is because there is spiritual power behind it. No delusion is devoid of spiritual power, for it is spiritual in nature. Formula 1 - making a universe: Nothing + nothing = two elements + time = 92 natural elements + time = all physical laws and a completely structured universe of galaxies, systems, stars, planets, and moons orbiting in perfect balance and order. Formula 2 - making life: Dirt + water + time = all living creatures. Evolutionists theorize that the above two formulas can enable everything about us to make itself--with the exception of man-made things, such as automobiles or buildings. Complicated things, such as wooden boxes with nails in them, require thought, intelligence, and careful workmanship. But everything else about us in nature (such as hummingbirds and the human eye) is declared to be the result of accidental mishaps, random confusion, and time. You will not even need raw materials to begin with - they make themselves too. But this is what God's Word says - which are you going to believe? Contrary to what evolutionists would like for you to believe, the theory of evolution is still just a theory, and no one can scientifically prove the idea that anything has ever evolved from one particular "kind" into another. Yes, we do see differences in species in different parts of the world, and mutations can occur. A mutation is not an adaptation, however, and mutations generally harm or kill the thing that is mutated. A species can actually adapt to an adverse environment and change to survive, and that adaptation can happen relatively fast (a lot faster than was assumed to support the evolution theory) as shown by experiments conducted by scientists around the world in recent years. But, no one has ever shown that a species can actually change into another species even in the tiniest way. Evolution is a belief, not a science. The previous point (speed of adaptation), however, simply adds to the argument against evolution since there are so many things about human beings that don�t fit into this mold at all. For instance, if we�ve evolved over billions of years on this planet; why can�t we see at night since we�ve spent half of those billions of years in the dark? Why are cats and relatively few other species the only one's endowed with this ability? And why does the sun burn us when we�ve spent half of those billions of years in the sun? Why haven�t we developed any protection from darkness and the suns rays or even moderate temperature changes? We haven�t had homes and desk jobs long enough to make the difference. We spent our time outside in the elements working our fields for food or hunting, etc. If evolution were a fact, we�d have much more adapted bodies to the environment we live in. Have our minds have made us so superior to animals that we no longer have the strength of animals or need hairy bodies and thick skin to protect us from cold, or fangs to tear the meat from our prey? And our natural ability to outsmart everything has made it so we don�t need any of those things? Hello??? Everything we know about human history is about warfare and competition and being bigger and stronger than our neighbour. We don�t have weaker muscles than animals because we don�t use them; we have these bodies because this is the way God made us. He separated us from the animals in many ways. The common theory states that there was matter and energy, already in existence, that exploded 15 billion years ago and has expanded into the present state of the universe. That basic science means that if I take the bicycle out in my garage and leave it sitting around and expose it to energy for 15 billion years it could turn into a living, breathing, ferocious tiger! Pretty stupid, huh? But that�s really what they�re trying to sell us, minus all the unproven �scientific evidence� that they say they have. Hard matter and energy somehow turned into biological life? And how do we explain the fallacy that two co-existing elements that can't live without each other (proteins and nucleic acids) spontaneously came into being at the same time? How far from logic do we have to turn in order to allow this to slip by our theories? Evolution is a belief, not a science. It actually takes more faith to believe in evolution than it does to believe in Creation! 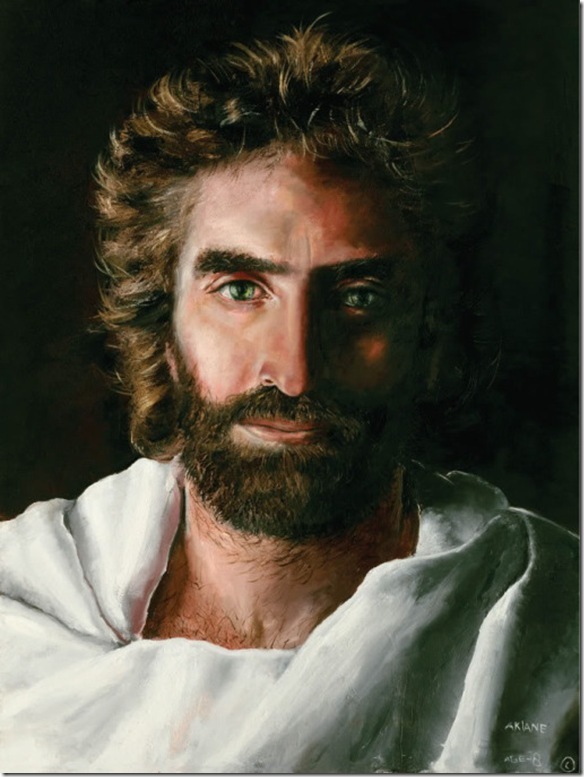 "... since what may be known about God is plain to men, because God has made it plain to them. For since the creation of the world God's invisible qualities--his eternal power and divine nature--have been clearly seen, being understood from what has been made, so that men are without excuse." There are many examples of so called "living fossils" today. These are plants and animals which evolutionists once thought to be extinct for millions of years but were somewhat inconveniently discovered to be still living, and worse, completely unchanged from the supposed millions of years old fossils. Here is the challenge to those who believe that the fossil record proves Evolution. If every fossil whose counterpart is still living has not changed in �millions of years�, why should we believe that the fossils whose species are now extinct have changed from a lower life form prior to their becoming extinct? If hundreds of �living fossils� have not changed, why should we believe that the extinct creatures did change, especially when the fossil record is void of any intermediate fossils between the species they are alleged to have changed into? I believe it is simply this: People believe it because this is what they are told all their lives without sincerely examining the evidence for themselves. �Prove all things� (2 Thessalonians 5:21). Please click here to see many examples of living fossils. Monkeys Evolved Into Men About 3 Million Years Ago? Some of the most audacious frauds in the history of science were perpetrated in order to provide �evidence� that monkeys (or some unknown monkey ancestor) evolved into humans. The passion some old-earthers felt for their evolutionary imaginations led them to manufacture �evidence� of evolution. Some of these proven fraudulent evidences are even still the cornerstone of chapters on evolution in textbooks. The highest heights of intellectual fraud are perpetrated in defense of Darwinism (which is analyzed in Chapter 14). �Neanderthal Man� has been championed as a transitional creature between monkeys and humans. He has thickened brow-ridges, a receded jaw, humped over posture, bow legs, and arms that were thicker than ours. He was short and stocky, a perfect candidate to be a monkey-man. When Robert Virchnow discovered Neanderthal Man, he theorized that the unusual physical features of the specimen were due to rickets and arthritis. Virchnow thought it was human all along, but merely suffered from a few pathologies. Then old earth evolutionists got hold of the specimen and declared that it was part monkey and part man, and of course, heralded it as the latest �proof � of evolution. However, rickets and arthritis probably caused the bone distortion in Neanderthals because during the Ice Age, after the Flood, the heavy cloud cover shielded the earth from the sun. Most of the vitamin D we use is generated by UV rays from the sun penetrating our skin. During the extremely cloudy Ice Age, little vitamin D was manufactured in humans, so some of the people suffered from rickets, which distorts bone growth, as evidenced in Neanderthal Man. People in Europe, during the Industrial Revolution of the 1800�s, suffered from rickets because of the near constant cloud cover that formed from the smoke of all the coal burning factories in Europe. Neanderthal Men were people who also didn�t get enough vitamin D and, therefore, suffered from rickets. They were fully human, but disease-ridden and old, Ice Agers. They probably lived well over 100 years, as the Bible says that human life spans decreased rapidly in the ten generations or so after the Flood. Greater ancient human life spans are confirmed by many ancient historians, such as Berosus, Nicolaus, Hesiod, Hecataeus, Mochus, Hieronymus, and Manetho. Extremely old senior citizens often are bent over, and their facial form has changed; this could be a toned-down picture of what helped cause the look of Neanderthals. If monkeys really did evolve into humans, you would think the old earth evolutionists would have some legitimate evidence of transitional humanoids. All the �proof fossils� of this proposed evolution are frauds, or are grossly misidentified. The desperation of the Darwinists� scramble for legitimacy is certainly mind-boggling. Human �Races� Are Evolving Just As Animal �Species� Are Evolving? The growing popularity of Darwinian evolution in the late 1800�s encouraged a mindset that allowed the dehumanization of many people. It was thought that certain people groups were less evolved and not fully human. An African pygmy was displayed with an orangutan in a cage in the Bronx Zoo. The Australian aborigines were thought to be part monkey and part man, and were hunted and killed, like wild game. The white Europeans took the dead bodies to their friendly local taxidermist, then proudly displayed their stuffed people. A popular sentiment in the Civil War South was that blacks had not quite left behind their monkey-like ways, therefore they did not deserve to be treated much better than monkeys. Some Japanese think people with a lot of body hair are part monkey. The societal disruptions resulting from Darwinian philosophy are certainly a product of scientific racism, the scientific �green light� to consider �racial� differences a result of Darwinian, mutation driven, human evolution. Softening the racist implications of evolutionary theory, the old earth evolutionists allow the impression that since full humans evolved from part monkey and part human creatures over millions of years, only a few benefited from the final random mutation which catapulted those fortunate few into full humanness. So, only a few became fully human, the rest remained a little bit monkey; therefore, these first full humans dominated, and multiplied, and thus passed on their new and fully human genetic make-up to their superior descendants. Thus, evolutionists can say that the �races� are evolving from the original full humans, not from monkey-men. Nevertheless, the differing characteristics of the various people groups (races) must still be rationalized under the rubric of Darwinian dogma.4 Therefore, following the logic, some �races� will eventually prove superior to others, and will dominate and multiply, passing on their �superior� genes to their plentiful offspring. Clearly, this toned-down version of human evolution still presumes genetic superiority of some people groups over others (as demonstrated by Darwinists killing aborigines to study them.) Adolph Hitler was privy to this �kinder and gentler� version of evolution; what would he have done with only the original version? The first full humans, who benefited from the alleged final mutation which catapulted them out of part monkey-ness, were a small group. Thus, the gene pool (pool of genetic variety) of these few humans was small. So, for human diversity (races) to have developed, mutations must have added genetic information to this initial small gene pool. Such is impossible, however, as mutations always destroy or rearrange genetic information, never adding information (as noted in Chapter 8). Mutant creatures (like shortwing bugs on a windy island) occasionally thrive, but only because the mutation is fortuitously beneficial, not because the creatures are �adapting� to a particular environment through genetic enhancement. Poodle dogs are the end product of selective breeding over multiple generations. The poodles have a smaller gene pool than their wild dog ancestors because the dogs that were bred through the generations were those that showed more characteristics of the envisioned new breed (poodle). The dogs that did not look similar to the envisioned new breed were not bred, so through the breeding generations, genetic information was removed from the gene pool by not breeding the dogs with undesired characteristics. Therefore, the end results of this selective breeding have a much smaller gene pool than their wild dog ancestors. In corollary, because of their limited gene pools, when poodles mate, only poodles result; but wild dogs, because of their larger gene pool, can mate and produce different looking dogs. Since variety in offspring results from breeding within a relatively large gene pool, could it be that the human �races� developed from ancestors of a larger gene pool? It seems so, in direct contradiction of Darwinian fancy. Poodles, which mate with poodles, have poodle puppies, but wild dogs (mutts) mating together can produce different looking puppies. Analogously, white people who mate with white people have white babies, while mulatto people (part white, part black) who mate with mulatto people can have babies of differing colors. The mulatto people have a larger gene pool than white people, and than black people, so a larger variety of characteristics are possible in their offspring. It does seem that the original humans must have had a large gene pool, so that variety (races) would manifest in subsequent generations. Darwinian theory directly contradicts this dictum of genetic science. Science Magazine reported that �useless� DNA segments (introns) from men of various parts of the world, surprisingly to Darwinists, have no mutational variation. From this �startling� revelation, it was estimated that humankind has been extant only thousands of years, not a couple of million. Scientists from the University of Oregon Medical School who studied human hemoglobin variation concluded that humanity endured a population bottleneck in the recent past and actually reported that Noah�s Flood (with only eight people in the Ark) could have been this historical human population bottleneck. So, all the humans of the world came from a few large gene pool ancestors, all the dogs from a few large gene pool ancestors; the same for the cats, horses and asses, whales and dolphins, cattle, etc. It seems the millions of �species� in the world come from a far less numerous variety of ancestors. This so-called �speciation� (an evolutionists� term) occurs as gene pools diminish, not as gene pools enlarge (as evolutionists intimate). Some �species,� which are of the same animal kind, are reproductively isolated from each other, like zebras and donkeys (zeedonks). They are able to mate and produce offspring (proving they are of common ancestry); however, the offspring are sterile, so cannot breed. Protein imprinting on genetic material, caused by mutations, can effectuate this alteration of reproductive capacity of offspring. Just because similar looking �species� produce sterile offspring does not mean they have disparate ancestors. The genes of one of the �species� were imprinted, so major interbreeding with the other �species� was no longer genetically productive (because interbred offspring were sterile), but intra-breedings within their respective �species� were still practicable. This protein imprinting is one of the mechanisms by which animal kinds divided into various �species,� through the generations. The relatively few original animal kinds (which had large gene pools) reproduced, and their offspring moved away in isolated clans. These clans had smaller gene pools because they carried only a portion of their parents� genetic stock. In isolated breeding groups like these, recessive genes could become dominant genes, and thus, produced new physical characteristics (as in poodle breeding, if you will). Some of these characteristics, such as thick fur, allowed long life for a creature in the north, so it had more offspring than a short hair brother who would freeze at an early age in the cold (Ice Age). The thick fur brother passed his thick fur gene on to his offspring, while the short hair brother died early, having no offspring, and thus, the gene for thick fur would become dominant in cold climates. The opposite applies in warm climates. Different behavior and size of the individuals within the respective clans also caused �speciation.� Lions and tigers became natural enemies, although they have common ancestors; a cheetah would have a hard time mating with a house cat, as would a Clydesdale horse with a Shetland pony, or a llama with a camel, and so on. The more physically different the clans became, the less likely was their interbreeding. The climate of the earth was much different after the Great Flood. The Ice Age was developing higher precipitation, both snow and rain (rain in the lower latitudes). And mountains had risen, so there were new ecological zones to which the animals needed to adapt. Some animal characteristics worked well in some areas of the world, and not so well in others. The genes of the successful animals were passed on to their offspring, while the ill-suited animals died off. When human clans dispersed across the globe, they, too, changed in their physical appearances, as did the various animal kinds� clans, thus, developing the various people groups (races). The unique characteristics of the people groups developed in response to many of the same factors which cause �speciation� in the animal clans. Genetic pool predisposition for certain traits (resulting from the division of the original genetic pool into the clans� small pools) is evident in the indigenous, light skinned, South Americans. They live in a sunny climate, so are more susceptible to skin cancer because of their light skin; darker-skinned people are better suited in this climate. These light-skinned natives did not adapt to the sunny climate (become, through Darwinian evolution, darker). They had a genetic predisposition for light skin in their early gene pool, so they became light skinned, and just happened to migrate to their sunny environment, where they survive, despite an ill-suited genetic characteristic. The Summit tribe of Alaska are dark skinned, yet live in a cloudy environment. Dark skin minimizes UV penetration from the sun. UV penetration generates most of our vitamin D, so dark skinned people are ill- suited for cloudy areas because they might suffer rickets. The Summit ancestral genetic pool is predisposed toward dark skin, and they just happened to move to a cloudy environment, and survive there despite their ill-suited skin color. Remember Neanderthal Man from Chapter 13? He probably was a dark-skinned human who migrated near the Ice Age ice sheet in a very cloudy environment. His dark skin resulted in vitamin D deficiency; thus, his bones thickened and bowed, the symptoms of rickets. The Summits, however, ate a lot of fish, a great source of vitamin D, and thus averted rickets. Darwinism predicts that animal �species� and human �races,� respectively, are evolving divergently through mutations which add information to their gene pools. In reality, the �species� and �races,� respectively, have differentiated through genetic variation from the large gene pools of the original ancestors to the smaller pools of the more specialized descendants. However, the genetic variation between the �races� is surprisingly small. Take any two people, randomly, from the earth�s population. The genetic difference between these two is actually less than the average genetic differences between people of the same �race.� Therefore, we are one; the human kind biologically branched out (as did the animal kinds) because of differing gene pools in differing climates and terrains, not because of evolution �adapting� creatures to environmental variations through allegedly beneficial mutations over million of years. And much, much more. This is a "must read" for everyone to learn what evolutionary scientists really believe, and how ridiculous it really is. You surely wouldn't want to be counted among them after reading this. Now is the time to begin the process of "unbrainwashing" yourself. The Evolution Cruncher is a trimmed down version of the full book, Science vs. Evolution which we have provided below. This is an excellent, illustrated resource.